It is really wonderful when a children’s picture book can be captivating and educational. 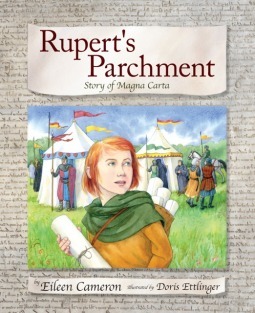 Author Eileen Cameron’s story of the Magna Carte, Rupert’s Parchment is such a book. Rupert, twelve years old, is the son of a parchment maker. It is Rupert’s father’s parchments that King John uses for writing his promises to the people of England, and Rupert has the perfect seat for observing and relating the story of this tremendous event. Author Cameron masterfully manages to bring awareness of just what this event meant to the people of England. It is powerful, it is exciting, and it is very, very real. Making a historical event something that a child can relate to, is more difficult than one might think, but as a reader, I found myself drawn in to this story, and I know younger readers/listeners will too. There is some nice information about the Magna Carta following the story for the adult readers, and somehow, this entire book is only twenty pages long! The illustrations by Doris Ettlinger suit the book well. Although I was familiar with the concept of the Magna Carta, I couldn’t have told you much about it, and this children’s book was a good primer for me, and I suspect for many adults (at least in the United States). I highly encourage this simple, informative book. Looking for a good book? Rupert’s Parchment is a children’s picture book with a big history theme and it’s worth having and reading.